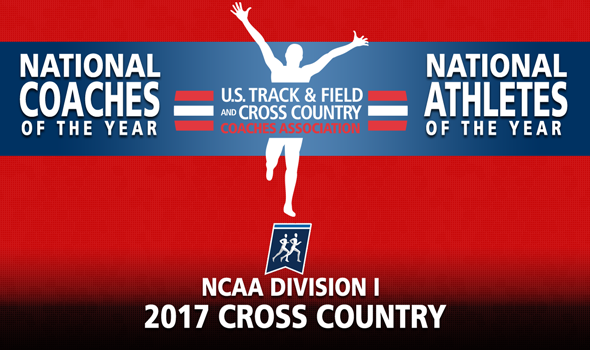 NEW ORLEANS – National Athletes and Coaches of the Year for the 2017 NCAA Division I Cross Country season were announced Tuesday by the U.S. Track & Field and Cross Country Coaches Association (USTFCCCA) following the national championships in Louisville, Kentucky this past weekend. Justyn Knight of Syracuse and Ednah Kurgat of New Mexico were named the Men’s and Women’s National Athletes of the Year, respectively, after winning individual titles to complete undefeated seasons. Michael Smith of Northern Arizona and Joe Franklin of New Mexico earned Men’s and Women’s National Coach of the Year honors, respectively, after guiding their programs to victory at E.P. “Tom” Sawyer Park. Scroll below for more information about the four award winners. The runner from The Six finally got The One. Justyn Knight won his first NCAA individual title this past weekend when he crossed the finish line ahead of 249 other runners in 29:00.2. Knight used his trademark kick to surge past the Northern Arizona duo of Matthew Baxter and Tyler Day in the final 400 meters. The native of Vaughan, Ontario, Canada had finished runner-up to Patrick Tiernan in 2016, fourth in 2015 and 143rd as a freshman. Knight never lost on the course this year as he captured individual titles at the Nuttycombe Wisconsin Invitational, ACC Championships and the Northeast Region Championships before turning his attention to NCAAs in Louisville, Kentucky. He is the first Syracuse athlete to win this award and first from the ACC to do so as well. Ednah Kurgat left no doubt that she was the premier athlete in NCAA Division I Women’s Cross Country this season. Kurgat entered NCAAs with an undefeated record and left with it intact as she cruised to the individual title ahead of Washington’s Amy-Eloise Neale. The native of Eldoret, Kenya crossed the finish line in 19:19.5 and set a NCAA Championships record time for the 6K distance. After sitting out the 2016 season due to NCAA transfer rules, Kurgat dominated every meet in which she competed. Kurgat won individual titles at the Joe Piane Notre Dame Invitational, the Nuttycombe Wisconsin Invitational, the Mountain West Championships and the Mountain Region Championships before taking on all comers at the NCAA meet. Kurgat is the first New Mexico athlete to win this award and the first female athlete from the Mountain West Conference to do so as well. Northern Arizona entered the season ranked No. 1 in the Men’s National Coaches’ Poll. That’s where Smith’s Lumberjacks finished the season as well – right on top. NAU won its second team title in a row and this year it wasn’t even close. The Lumberjacks won by 53 points as they had five All-Americans led by Matthew Baxter (second), Tyler Day (third) and Peter Lomong (eighth). In addition to winning the NCAA title, NAU captured team crowns at the Nuttycombe Wisconsin Invitational, Big Sky Championships and Mountain Region Championships. For the second time in the past three years, New Mexico is on top of the mountain. Franklin’s Lady Lobos captured their second national title in three tires this past weekend and they did so in the same place they won their first – Louisville, Kentucky. New Mexico had four All-Americans and won the team title by 15 points. The Lady Lobos also won a team title at the Nuttycombe Wisconsin Invitational and Mountain West Championships, while finishing runner-up at the Joe Piane Notre Dame Invitational and at the Mountain Region Championships. This is the third National Coach of the Year honor for Franklin. He also won in 2015 after leading New Mexico to its first national title and in 2004 when he was the head coach at Butler and guided the program to a fourth-place finish at NCAAs.